On May 5, 2010 Sapp Design Associates Architects, PC was presented with a total 7 of the 14 American Institute of Architects (AIA) design Awards given at the AIA Springfield’s awards reception. Each project was judged by both a Public and a Professional jury. 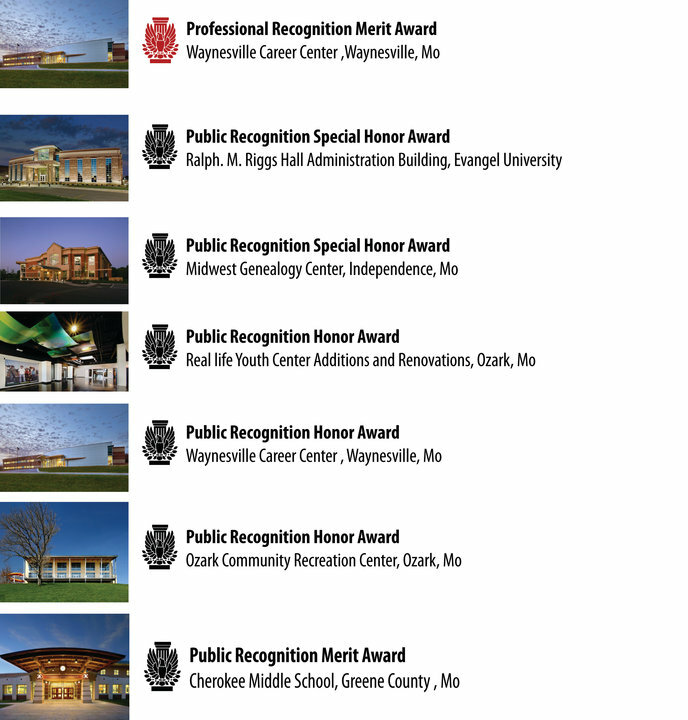 Sapp Design is very grateful for its 6 Public Recognition Awards 2 of which were given the most prestigious award of, ”Special Honor Award” for our work on Ralph.M.Riggs Hall located at Evangel University and the Midwest Genealogy Center located in Independence, Mo. What excites SDA about each of these recognition awards is the fact that these designs were created for publicly funded projects with very conservative budgets. Receiving this recognition is a real Honor and a testament to our design philosophy of creating designs that are “Great Places timeless in design”. SDA is also honored to receive a Professional Recognition Merit Award for the Waynesville Career Center located in Waynesville, Mo. Thank you to the juries for all their gracious commits and a very special thanks to our clients, because great projects can’t happen without great Clients!